What is there in Obama’s victory for Russia? Obama has an ambitious agenda with regard to global disarmament and nuclear non-proliferation and Russia can play a major role to play in the realization of his vision. It is, relatively speaking, an easy question for Russia, because Obama’s victory can be good for the US-Russia relationship. But it is also a complex question for Russia, since it mixes memory with desire, and the answer is fraught with caveats some of which at least would depend on what Russia chooses to make out of Obama’s agenda. Obama is a rare politician with a formidable intellect and an erudite mind and he will keenly choreograph his presidential legacy during the four-year period ahead in the Oval Office. As a great patriot, he is bound to view this legacy through the prism of the US’ vital interests and core concerns. Obama won’t be remembered for starting another war. The world will be a calmer place to live, to that extent. He would know that over 80 percent of Americans today, Democrats and Republicans alike, are inclined to estimate that the primary objective of the US’ foreign policy should be to create jobs in their economy. Only less than 15 percent think the US foreign policy should aim at propagating ‘values’ – democracy, human rights, etc. Obama isn’t going to be evangelical about Russia’s democracy project. He will also be highly receptive to any Russian overture to American business interests. Obama isn’t going to instigate Tbilisi with a view to entrap Moscow in another conflict or to post-haste shepherd Georgia into the NATO tent. He will not browbeat Viktor Yanokovich into making his existential choices. True, he may take renewed interest in Central Asia but that isn’t necessarily Russia-centric. Again, Obama is not looking for a confrontation with Russia over either Syria or Iran. The signs, tentative though, are that he may well opt for a regime-led change in Syria rather than a regime change through intervention. In fact, Russia would do well to anticipate that the onus is going to be on it to ‘deliver’ on Syria. Obama is, most certainly, hoping to engage Iran in direct talks and a pathway leading in that direction is fast emerging. But Obama will not be dependent on Russia’s good offices in engaging Iran (Iranians also do not want a third party to be brought into its one-on-one with the Americans). Russian experts blithely assume that the US is heavily dependent on Moscow for settling regional issues such as Syria or Iran, but Russia’s role needs to be seen in perspective. 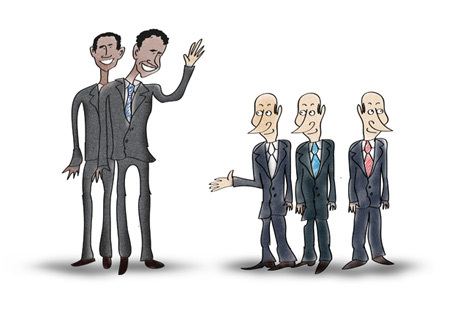 Indeed, Obama’s second term is going to be a transformative period in the US’ Middle East policies. From the US standpoint, the new political map of the Middle East poses serious challenges but the problems are not Russia’s creation. The core issue is that the democratisation process in countries such as Egypt or Syria would inexorably lead to the ascendancy of Islamism and the US has important choices to make, which have long-term implications for its and its allies’ core interests. Quite obviously, the Muslim Brotherhood in Egypt is not seeking confrontation with the US; rather, it is ‘Islamising’ the Egyptian society and its government is taking new directions in foreign policy – all of which the US needs to come to terms with. Now, Russia cannot help either in influencing the Brothers or defining which is the ‘right side of history’, leave alone being the alchemist setting the US’ discourse with the Muslim world. Moscow is not a key protagonist in the shaping of the US’ Middle East strategy, unlike what many Russian experts may assume. On the other hand, it gives Russia a relatively free hand to develop its own ties with that region in a ‘de-ideologised’ setting. Syria nor Iran – or the march of the Brothers on the Middle East’s landscape – is not a Russian-American problem, although they have geopolitical connotations and Russia could be an interested party. Nor will Arab Spring go away if the US-Russia ‘reset’ revives. Even with regard to Afghanistan, one should not exaggerate the criticality of the Northern Distribution Network [NDW] except in the highly unlikely event of another closure of the Pakistani transit routes (Obama can be trusted to repair the fractured US-Pakistan relationship at an early date, which is crucial for the stabilisation of Afghanistan. That is to say, Russia’s help and cooperation is useful, but then, it needs to factored in realistically that Russia is also helping itself insofar as the NDW operates on commercial basis and Russian supplies for Afghanistan are mostly paid for in hard cash (not gratis), and in any case the US-led war also serves Russia’s vital security interests. Now, Obama’s top priority will be the calibration of the US’ ‘rebalancing’ toward Asia. Where does Russia figure in it? One can expect that in his second term, diplomacy may matter to a greater degree, now that the need for grandstanding and strident rhetoric endemic to democratic elections is no longer there. Obama will strive to build a dialogue with the new leadership in Beijing at an early date so that the possibility of military confrontation between the two countries simply doesn’t arise. China is uniquely placed today to help in the recovery of the US economy. As China shifts the accent from its hitherto export-driven growth strategy to boosting domestic consumption and opening up the domestic market, seamless possibilities arise for the US business. The interdependency of the two countries becomes a stabilising factor in the US-China relationship. Equally, US’ military ‘rebalancing’ is generating widespread scepticism among its Asian partners. Very few would take it as a done thing, given the US’ economic wherewithal to implement the strategy. Asia is caught up in a power drift where everyone is hedging bets about the US’ staying power to arrest the expansion of Chinese military power. Russia can fit into this emergent paradigm where Obama’s need would be to actively encourage a fostering of regional cooperation that advances the US’ strategic interests in the region. Russia also needs to take cognizance that the Cold War is truly over. Global strategic balance becomes an archaic concept in a multi-polar world. The spectre of cyber wars re-configures the frontiers of violence that mankind has known so far. Suffice to say, as things stand, there is no reason for the US to compromise on its missile defence program. Obama would even have a problem to defend any ABM concessions to Russia in the US Congress. The utmost ‘flexibility’ that can be expected from Obama is a postponement of the deployment of the ABM system (which may be necessitated anyway because of financial compulsions) and greater transparency in the management and control of the project, with Russia probably being allowed in for an insightful peep into it. The heart of the matter is that the project as such is integral to the NATO Strategic Concept 2010 and is a vital template of the post-cold war era Euro-Atlanticism. The Russian policy is unable to leverage any lobby in the US to its advantage. Perhaps, Russia’s entry into the WTO can help rapidly build an economic partnership with the US. Unless and until that happens, things cannot substantially change and it becomes a moot point whether Obama is going to revive the ‘reset’ or not (in all probability, he will). The ‘reset’ adequately serves the purpose of engaging Russia selectively where there may be need while Obama focuses on the priority areas of foreign policy. To be sure, Obama has an ambitious agenda with regard to global disarmament and nuclear non-proliferation and Russia can play a major role to play in the realization of his vision. The good thing is that Obama is not looking for an opportunity to put down Russia. Nor is he working on a containment strategy toward Russia. Arguably, he doesn’t lose sleep over Russia’s domestic politics, either, and Russia doesn’t seem to realize that it indeed has a free hand to undertake its much-needed political reforms. Such reforms, in fact, may have interesting fallouts for the US-Russia relationship, too. Simply put, Obama doesn’t give undue importance to Russia, but then, he isn’t any different when it comes to the US’ European allies, either. Obama has a very focused mind. His itinerary while reopening foreign-policy business after months of absence includes a visit to Myanmar. It is a signpost of the road ahead.